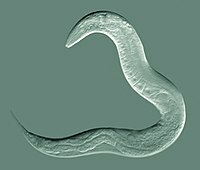 The nematodes or roondwirms constitute the phylum Nematoda. Thay are a diverse ainimal phylum inhabitin a broad range o environs. Nematode species can be difficult tae distinguish, an awtho ower 25,000 hae been describit, o which mair nor hauf are paraseetic, the tot nummer o nematode species haes been estimatit tae be aboot 1 million. ↑ "Nematode Fossils". Nematode Fossils [Nematoda]. N.p., n.d. Web. 21 Apr. 2013. ↑ Hodda, M (2011). "Phylum Nematoda Cobb, 1932. In: Zhang, Z.-Q. (Ed.) Animal biodiversity: An outline of higher-level classification and survey of taxonomic richness". Zootaxa. 3148: 63–95. ↑ Zhang, Z (2013). "Animal biodiversity: An update of classification and diversity in 2013. In: Zhang, Z.-Q. (Ed.) Animal Biodiversity: An Outline of Higher-level Classification and Survey of Taxonomic Richness (Addenda 2013)". Zootaxa. 3703 (1): 5–11. doi:10.11646/zootaxa.3703.1.3. ↑ Lambshead PJD (1993). "Recent developments in marine benthic biodiversity research". Oceanis. 19 (6): 5–24. This page wis last eeditit on 16 Februar 2017, at 17:17.